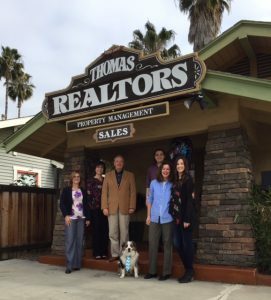 Thomas Realtors is celebrating 40 years of service to the North Park community. Hal Thomas founded the company in 1977 and played a vital role in the revitalization of North Park. He has served as president of the San Diego Business Improvement District (BID) and the North Park Lions Club, where he has been a member for more than 30 years. In 2007, his son, Travis took over operations and continued the company’s tack record of care and service to its customers. We, his team of agents, are now honored to continue the legacy of superlative service to owners and tenants alike. So whether you need to have a property managed, sold, or need a place to rent, stop by or give us a call—we’ll be doing what we always have—serving our customers and investing in the community. Thank you. Juli brings over a decade of real estate experience to Thomas Realtors. She had specialized in residential resales and represented numerous buyers and sellers all over the city and county. Juli graduated from Point Loma Nazarene University with a degree in Business and a Minor in Accounting. Her business experience includes working as a tax preparer and bookkeeper, prior to that she worked at the San Diego Zoo for over 14 years in the Membership and Development departments. Juli and her husband of 22 years, Chris, reside in San Diego with their son and two daughters. Tiffany is our president and senior agent here at Thomas Realtors. She prides herself in providing excellent service to both her owners and tenants. She also loves helping her owners sell their properties and works hand-in-hand with our full-time sales agent, Eydie Chapman to get the job done. T. Edwin Patton since November of 1961, has been actively involved in real estate development, home construction and sales and marketing management in San Diego County California as well as Louisiana and Florida. From April of 1986 to October 1989, Ed was the general partner of the West Village of Singing Hills a community of 170 patio homes on Willow Glen Drive alongside the Oaks golf course at Singing Hills, in El Cajon. Recently he and his son and daughter have built several homes for themselves and for clients mostly in East County and Pacific Beach. In June of 2008 he joined the firmly established property managemnent team of Thomas Realtors in North Park. Eydie brings almost a lifetime of real estate and related experience to Thomas Realtors. Working her way through Point Loma Nazarene University as a sales and financing associate for the Singing Hills Golf Course development was her first exposure to the industry. Further experience in Human Resources and Accounting, along with her love of people, has made her decision to sell real estate full time for the last 10 + years an easy and enjoyable one. Jay has been with the Thomas Realtors team for 4 years, and came on full time as a licensed real estate agent in 2016. Jay provides expertise in business administration and management, and takes pride in empowering his clients, tenants, and business partners alike. Jay is currently pursuing a degree in finance at San Diego State University. Personally, Jay enjoys spending time with family and friends, dining out, and has an unabashed love for all things cars! Taylor is a real asset to the Thomas Realtors office. After studying kinesiology at Vanguard University, she joined us as our full time office manager. Her expertise in all things technology, efficiency and beautiful smile have made her an indispensable part of our team. Taylor is a native San Diegan and enjoys wine tasting and interior decorating.